Ms Mauricia Nambatya is a civil engineer with a First Class Bachelor’s degree in Civil Engineering from Makerere University, Kampala and an MPhil in Engineering for Sustainable Development from the University of Cambridge. 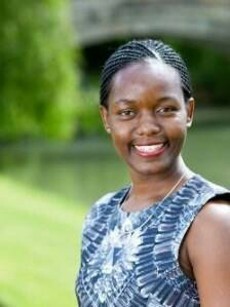 Having previously worked for German engineers Gauff, Ms Nambatya joined Haileybury Youth Trust Uganda, firstly as its Assistant Country Manager and then as its Country Manager in June 2016. She manages the Trust's operations and leads a staff of 9 in the on-job training of formerly unemployed young people in Uganda to build sustainable buildings using interlocking bricks made from stabilized, compressed earth: a low cost, carbon-saving alternative to the environmentally damaging fired brick. The youths are trained to build classrooms, kitchens with energy-saving cook stove as well as WASH facilities (rainwater harvesting tanks and latrines), resulting in not only their increased employment opportunities but also access to education, improved health and environmental awareness in their communities.